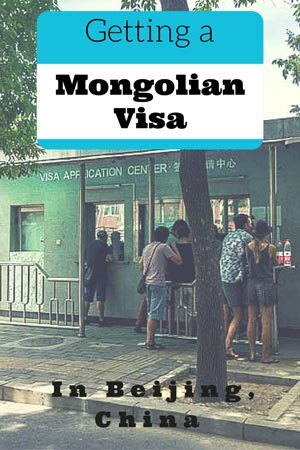 Getting a Mongolian visa in Beijing was perhaps one of the easiest visa applications we have ever done. We had no idea how to do this when we first got off of the train from Shanghai, but we were determined to do it ourselves without using an agency. Everything went smoothly and we were thankful that we did. For those who want to do this themselves, here is our guide for getting a Mongolian visa in Beijing, China. First of all, it is important to know that citizens of 42 specific countries do not need a visa to enter Mongolia for stays of up to 30 days. If you are one of these lucky people, you can visit Mongolia without having to apply for visa. For the rest of us, you need to jump in line just like we did. NOTE – Countries applicable for visa-waivers in Mongolia constantly changes. Please refer to this website for latest information. Visa-free countries for Mongolia. Lucky buggers! Where Is The Mongolian Embassy In Beijing? The Mongolian embassy in Beijing is located at 2 Xiushui N St, Chaoyang. The visa application window is across the road from the Ethiopian embassy. See the map at the bottom of this post. To get there via public transport, take the metro to the Yonganli Station and take exit A1. Turn right at the T-intersection where the Silk Market is and take your first left behind the mall and through the small car park. Turn right at the end and follow it past the street parking. Take your first left and continue along past the American embassy. Take the first left and walk towards the end where the building with the DRC sign is. Turn right and walk another 50m. The visa application window is on your right. You can also walk there in about 20 minutes from the Beijing Railway Station (maybe quicker if you don’t get lost). There is a tourist information centre across the road from the train station if you need to ask for directions. The visa application window at the Mongolia embassy. The Mongolian embassy is open for visa applications from Monday to Friday, between 0900 and 1200. Visa collection is between 1600 and 1700, Monday to Friday. Be aware that the embassy is closed for all Chinese AND Mongolian holidays, including for the whole period of the Naadam festival (usually the 11th – 13th of July). You do not need many documents to apply for a Mongolian visa. One photocopy of the information page of your passport. One completed application form (you get this from the embassy). A credit card to pay for your application. If you need to pay cash there is a bank not too far from the embassy where you can pay the fee, and then return with a receipt. As far as we know, the bank is the “Bank of China Jianguomen Waidajie”. Make sure you have enough time to return with your receipt before the embassy closes, otherwise you will need to come back the next day. How Much Does A Visa For Mongolia Cost? Note – The 30 day single entry visa gives you 90 days to enter Mongolia from the date you receive it. The 30 days then starts once you cross the border. If you need a passport photo there is a lady hanging around who has a van close by. She can take and print passport photos for you (we think the cost was about 50RMB for four photos, but don’t quote us on this). She will also glue it onto the form for you. Go up to the far left window and ask the lady for an application form. For the section on the form that asks for an address in Mongolia, either just write down a random hostel or do what the guys in front of us did – Write “Ulaanbaatar, Mongolia”. When you arrive at the Mongolian embassy there will most likely already be a line (unless you are very early). We arrived at 10.30am and there were about 10 people in front of us, most of them agents with many passports to process. When you reach the window hand in all your paperwork. In our case the lady never asked us a single question. Not one. But don’t expect this to always be the case. Have an itinerary planned in your head and be ready to quote it if she asks anything. The lady will then tell you to come back in three working days to pick up your passport, excludiing the day you applied. We handed our passports in on a Wednesday and she told us to collect them on Monday. We asked if we could pick them up on Friday as we had a train to catch on Sunday (this was not true). They did not seem overly happy with this idea, but agreed that we could pick it up Friday. Definitely worth a shot. Go to the second window and pay the visa application fee. Note that they only accept credit card at this window. You will then be given a receipt. Do not lose this, as you will need it to collect your passport later. Special note – Although the embassy is meant to close at midday, they stayed open for us until almost 1pm due to the delay in processing everyone. We couldn’t believe our luck, but don’t expect this to be the norm. When the day comes to pick up your Mongolian visa, head back to the embassy between 1600 and 1700. We got there at 1530 and there was one lady in line, but a lot of agents standing around. When it got to 1600 the agents pushed in front of us (typical Chinese culture), but this didn’t matter as everyone moved through very quickly. When you get up to the window hand in your receipt and they will give back your passport. Double-check everything before you leave the embassy. The lady actually told us to do this anyway. If you find anything incorrect, you will need to have this fixed then and there, before you leave. You cannot come back the following day if you spot an error, so make sure you study all the details. If everything is all fine, then you are going to Mongolia! Time to do a little happy dance! However, all I provided was my trip.com confirmation email about the cheap train I’d booked from Beijing to Erlian (about $20), which is the first leg of my journey (and still within China of course). This was satisfactory when I explained I couldn’t yet Mongolian train on other side of the border. I also gave a photocopy of a hostel booking confirmation in Ulaanbaatar, and a short planned itinerary of entry and exit, for legitimacy. Your post doesn’t mention this stuff too much, but for anyone who’s going to apply in the future, please do make sure you take along with you these sort of relevant documents as you would for most other visa applications. Otherwise you will leave the Mongolia Consulate in Beijing unhappy!! 2) Your updated directions (the simplified one – about leaving Yong’anli station at exit A1) are great, but still slightly off. The correct road to turn right on is not Ritan Road but Jianhua Road, just about 400m from Yong’anli subway exit A1. It’s the first turning on your right. Then, on Jianhua Road, take the first right after 150m onto Xiushui South Street, past the Cuba Embassy, and the Mongolia Consulate section of the embassy – where you need to go to get the visa – is just on the left hand side of the street. Thanks so much Hakan, We got our visa back in 2015 so this post is a little outdated. Sounds like things have changed and they are more strict with paperwork now. Thank you for the information. We will update it. Hey there guys! Absolutely loved the post! Very informative! I was wondering that for payment on the Mongolian visa, does debit/credit card mean only visa/mastercard are accepted or Unionpay cards too? Thank you so much Dave. We will update4 our information. Have a great day. Thanks Alesha and Jarryd for this very informative blog. We were going to pay the $230 to the Mongolian Embassy in Canberra, but after reading this blog it’s a lot cheaper and easier, and somewhat quicker to do it at the Mongolian Embassy in Beijing. BTW I’m UK and Australian (dual) and my wife is Australian. Does anyone know how current this 2015 blog is in March 2018. Also, from looking at the Beijing Mongolian Embassy website the fees are the same as in 2015, do these fees apply to all countries that need a visa (including the UK and Australia)? Hi David, people comment on this post regularly. It maybe a 2015 post but it also has become a forum for travellers. Any updated information that is given to us we update in the post. The post is not perfect so we do say to people check the Beijing Mongolia Embassy (which you have). The price for the visa does variate between countries. All the best with your visa. Have fun in Mongolia. Thanks Alesha and Jarryd. As per my question above I can confirm that a visa can be more easily and cheaply obtained through the Mongolian embassy in Beijing (than their Canberra embassy). I did it on 9 May 2018. Hi David in Sydney – did you see if their open hours are still Monday – Friday 9am-12pm for visa drop off? Is the processing time still 3 business days? We are in Shanghai at the moment and are contemplating going to Beijing earlier than planned to get our Mongolian visa in case they take more than 3 business days to process it. It also says on their website (the one linked in the blog) that they are only open Monday, Wednesday and Friday……since you’ve done it so recently I was hoping you could help out. How did you find the visa process? We’re the opening hours as you saw or still open all week, also we’re the processing times the same? I am wondering whether an invitation letter from mongolian travel agency is necessary for Indian citizen to apply Mongolian visa in Beijing ? Moreover, can I lodge my visa application without confirmed air ticket or its mandatory? Thank you for a great source of information! As my passport stays, I assume, at the embassy for 3-5 days, could I travel out of Beijing (the great wall, for example)? What about the accommodation in hostels without the passport? Is a copy enough? No worries Fran. We have done this in other countries and it has never been a problem. We are sure it is the same for China. Definitely photocopy your passport and your Chinese visa for your records. The hotels should be fine with that. Hope all goes well. Hi Guys, Your listing of countries able to access Mongolia is incorrect. I am from United Kingdom and on my third visit right now. Each time I visit I have to obtain a Mongolian Visa. This 2016 and 2017 two times. United Kingdom citizens have to apply for a 30 day visa. At the end of the visa an application can be made to the Immigration department near the airport for a 30 day extension this I did successfully in April 2017. However, if you apply for the extension then you cannot apply again for 6 months, i.e. 6 months after the date of the last day of the visa extension. I know this because I have fallen foul of this fact this week. Tomorrow I go back to Beijing for a new Visa and return. Thanks for your information and requirements in Beijing. I have applied successfully for a Visa in Beijing before and it has reminded me of the requirements like an invitation letter. Thank you for your advice. I have been applied for a Mongolian Visa today. They asked me for a invitation letter but I showed them my flight and the man said ok. They charged me about 415 Rmb for a Visa. A little bit different but it’s ok. Anyway, thank you guys a lots. Hello. Last week I went to apply for my Mongolian visa, they asked me invitation letter. But when I called the embassy and asked they never told me anything about invitation letter. Did anyone faced the problem like this? Hmm I’m off to the embassy tomorrow so will update this. OK john. Will be waiting for your reply. I went today. They took my visa form,passport, photo and photocopy of passport, and that’s it. Handed back my accommodation, travel insurance, flights, and didn’t ask for invitation letter. Ridiculously have to wait until Monday to pick it up, surely it could be done in 24 hours tops. Hey guys, thumbs up for the site, somehow it’s quite hard to find any info online. I’m planning to apply for a visa in Beijing next week and was wondering if you (or anyone else?) has been asked for onward tickets when applying for the visa? For Mongolia we didn’t get asked at all. They were so laid back. This was 3 years ago now so not too sure what they are like now. We crossed from Mongolia to China on the west side and that was impossible to book but we never got asked. If you are staying at a hostel, ask around and see what people say. All the best and happy travels. Thanks for replying. I got the visa. They didn’t ask for anything except the visa form (provided there), passport +copy and a photo. Note that the list of visa free countries has changed since 1st of January 2016. Some citizens still don’t need to apply in advance but this does not apply to Dutch citizens anymore. I am applying for a visa in Beijing in a couple of weeks, and I was just wondering – how many (working) days did it take you to get the visa as from the application date? Thanks! I would give it 4 – 5 working days. Maybe it is less but just to be safe. we will be applying for our mongolian visa in beijing next week. do you know whether it is possible to get a speeded up process for the visa? we are willing to pat more for that. Thanks for providing the only information I could find about obtaining a Mongolian visa online. I am indebted to you guys. Walk either side of the Silk Market. If you take the right side of the building, turn left into the carpark at the rear of the Silk Market just past a Subway sandwich place. First left before US embassy. Turn right at T junction. Hey presto; 10 minutes max. Queue at the far right window to submit documents. Pay at middle window and receive blue receipt with pick up information. Pick up is also at the far right window. Windows are tinted; basically impossible to see or hear anything from the person serving you. Yes, there are agents with multiple applications but these appeared to be processed quickly. I am an Australian studying in Nanjing and I need to head to Beijing at some point to get my Mongolian Visa. Does anyone know whether they offer to post passports once they have been granted a visa? I cant really hang around in Beijing for 5 days waiting for my passport, I know the Russian Consulate offers this service but I cannot find any details on whether the Mongolian does too, any insight would be much appreciated! Sorry Andrew. We are not too sure. Hopefully someone can help or you find some information soon. All the best. Happy travels. Hi my fellow traveler. I’m from Indonesia, and thinking to apply Mongolian visa from Beijing. Do we still need invitation letter? cause you don’t mention it from your experiences. Please, note that the visa exemption has ended (http://mongolianembassy.us/2014/06/42-countries-are-on-mongolias-visa-exemption-until-the-end-of-year-2015/#.V–MY3XtlHw). This was a temporary policy that wasn’t renewed by the Mongolia government. We went to the Beijing embassy today to apply for the Mongolian transit visa. We queued up from around 8.20am with about 10 other people. I followed the advice on the Mongolian embassy Beijing website which said we needed valid passport, passport photo, valid visa for destination country, copy of train/plane tickets and completed form (can be downloaded off their site). The visa office opened late (around 9.10am) and I was second in line. When it was out turn, we were told we needed a photocopy of the ID page of our passports and a photocopy of the Russian visa in our passports (final destination). So we had to leave and run back to the main road with the train station on it and go to the shop with ‘Kodak’ labelled on it to make photocopies. It was 5RMB for 5 pages. When we got back there were 3 people in the line (9.35am) but the guy immediately in front was an agent and he had around 70 passports with visa applications to process. We waited for around 1hr while this guy’s applications were processed before it was our turn. By the time we had finished everything it was around 10.45am. So we were there for a very long time. I recommend that anyone planning to do this process arrive before 9am, and make sure you have photocopies of everything. Because even though they take your passport with the ID page and the visas in it, they still want copies for some reason. And now there’s not even an answer … probably regretting what they’ve done. Sorry for not replying sooner – we’re too busy out living our lives. I don’t find it rude at all. Ask a question, get an answer. You don’t have to wait any longer just because we asked for a shorter turnaround. They say 5 days, you get 5 days. We ask for 3, we get 3. If you have a train, say you have a train. I find it rude that embassies give you a ridiculous time to get a visa when they obviously don’t need that long. I find it extremely rude to ask for a shorter processing time! Totally unacceptable! Why don’t you think of all the other people who now have to wait longer for theirs (perhaps even miss their train etc.) just because some people who don’t need their visa early ask to get it early? Hi I’m also wondering whether an invitation letter is necessary? thanks. really helpful! one question, did you need to an invitation letter from Mongolia for tourist visa? i called the embassy and was told i, chinese, need an invitation letter from Mongolia for the application. We didn’t need one but we know some nationalities do. If the Embassy said you do then you are one of those countries. Definitely get the letter so you can get your visa. It was an amazing country and you won’t regret it. Happy travels Liu. Is it possible to get Mongolian visa from Beijing.as I m indian passport holder. Hi Sheetal, we don’t see why not. But we are not 100% sure. Our advise would be to call the Mongolian Embassy and ask so you know for sure. All the best. Did you travel by an agency in Mongolia? I will be 6 days in total, and want to join a group as i will be alone. Could anyone recommend an agency which sets groups or so? What accommodation in UB would you recommend? Hi Esteban – get in touch with Selena Travel. They run amazing tours around the country, and are of a very high quality. Do you require a letter of invitation? I have read that Australians require this for entry into Mongolia. Great information thanks! Does anybody know if you can get a same day or 2 day service now? Awesome. Thank you so much for letting us know CL. Have a great trip. A quick question, after leaving Mongolia where did you go? Did you try to get a Russian visa? Thanks for the update Fede! We picked up another Chinese visa and crossed into Xinjiang province. from one of the Stan countries? I heard Chinese consulates there are notorious for being hard in issuing visas to anyone. Hi Lesh Jazza, is possible to cross from Mongolia to China by land through Xinjiang province? I am looking arond some info but is quite confusing… thanks for the info !!! Hi! Do you remember if the consulate offered two day or same day expedited service? Thanks for the excellent information in your post! I don’t recall seeing anything on their board about that, but can’t hurt to ask. Germans do not need a visa to enter Mongolia , too. You can find the updated list of Visa free countries on their Ministry of Foreign Affairs website as well as the application form. So as a German citizen i get my Visa on arrival? I am actually surprised you had to make a trip to the embassy to get Mongolian visa. AFAIK US citizens were exempted from visa requirements for MOngolia since ages ago. We had to go to the Mongolian embassy because we are Australian, not from the US. Most nationalities still need a visa. This page contained the best information we found regarding the Mongolian embassy in Beijing but the directions take you the longest, most painful and circuitous route possible (you essentially walk 20 mins to end up 5 mins from where you started) and fizzle out some time before you actually get there. Either that or they’re just unclear and we totally fluked finding it while following the directions wrong. I’d recommend simply heading West out of Yong’anil metro station (it’s the way you’re facing when you take exit A1) along Jianguomenwai Dajie until you reach Ritan Lu. Turn right onto Ritan Lu and then follow it until you see Xiushui Beijie on your right. Turn onto Xiushui Beijie and follow it until you see the embassy on the left (white gate). Grand total of 2 turns and all clearly signposted. All the rest of the information was golden, though, so props for that. Thanks very much for the correction buddy. Have updated the post to include your information. Enjoy Mongolia!